It’s amazing how the very same hike can be such a wildly different experience with as few as 8 weeks between seemingly identical adventures. Both trips involved the same exact trail, terrain, epic views and gear. Both weekends had perfectly sunny and clear days. Both experiences involved the camaraderie and support of incredible women. The difference between these trips for me - pregnancy. The first trip was just a week before the conception of our baby and the second trip was while I was 8 weeks pregnant. 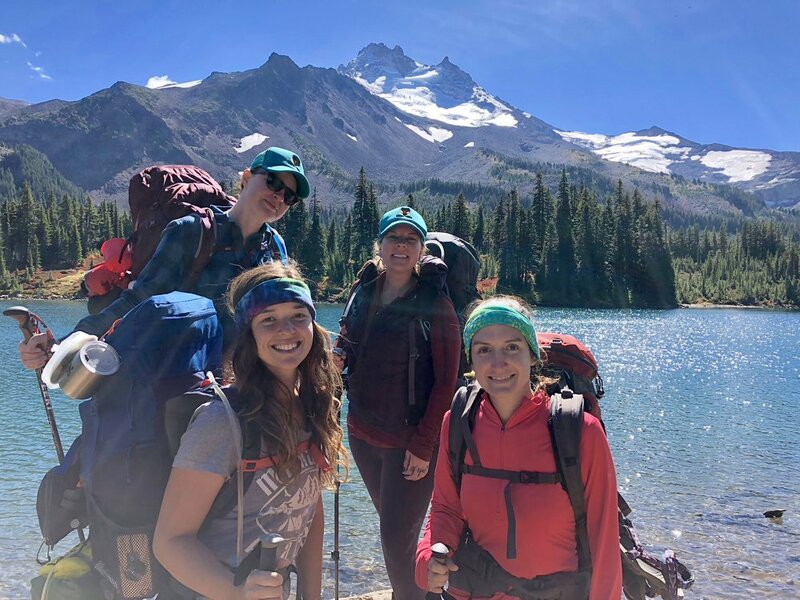 In late Spring of 2018, I had gathered with some of my favorite humans at Base Camp Brewing to plan our annual ladies backpacking weekend adventure. The setting was just right - you walk in through the patio covered in prayer flags, like the ones all over the Himalayas I saw on my first trek. As you step inside the building, you’re immediately inspired by the wall of rotating outdoor photography just behind the taps and can smell the delicious aromas of the Nepalese food from the Sherpa Kitchen food cart. The stoke level continued to rise as each person trickled in and we settled in to a table big enough to spread out maps. Over tasty beers and momos, the planning was ready to commence! What weekend would work best for all? The year prior we hiked 32 miles of the PCT from Potato Hill to Mosquito Lake in Mt. Adams Wilderness and it was amazing; also that was my first adult backpacking trip ever. With an incredibly full year of avid hiking, trekking and backpacking under my belt now, where would we go next? Perhaps Timberline Trail, Jefferson Wilderness, The Enchantments… Our considerations were relatively simple - we had all agreed on a 3 day trip in September and were comfortable backpacking up to 12 miles a day depending on elevation gain; we were just a group of rad ladies ready for adventure. After going back and forth on a loop versus an out and back + day trip adventures in between, we decided on Mt. Jefferson Wilderness. Fast forward to mid-July and I saw an event pop up for Mountain Chicks. Their ambassador, Ellen, was leading a 2 day backpacking trip to Jefferson Park from the South Breitenbush Trailhead. I had just purchased my first lightweight backpacking tent, the Big Agnes Tiger Wall, and the timing of her trip couldn’t have been more perfect for its maiden voyage! Although Mt. Jefferson Wilderness was on the radar for the other upcoming backpacking trip in September, I couldn’t turn down the opportunity to hike it twice; I’d seen so many beautiful photos and was stoked to make new friends - so I said yes to the adventure! Our weekend was amazing! I met a bunch of badass mountain babes from the Portland and Salem areas, engaged in meaningful conversation and backpacked 17 miles round trip with 2900 feet of elevation gain (those numbers are according to my GPS watch; the trail info said it was 13 mile r/t). Did the trip live up to it’s “difficult” classification in the Oregon Hikers trail description? Absolutely! And it was worth every ounce of sweat and all the aches my toes and feet could endure from the rocky trail! Backpacking Mt. Jefferson, Take 2. This time, while pregnant. Feeling incredibly satisfied from the Mountain Chicks version of this trip and eager to share, I immediately told my friends who I was planning the annual ladies backpacking trip with all about it! This trail, this wilderness, those alpine lakes, those views...I could visit this place day after day and never get bored with its majesty! Plans were set and we all eagerly awaited September. 3 weeks later though, I learned I was pregnant! My partner and I were over the moon! Nothing really changed about my immediate outlook on adventures for the rest of the summer and fall, although I knew that soon I’d need to start thinking about how to outfit my clothing for the trail once my belly started growing. A couple weeks went by and before we knew it, we were driving up to Anacortes and taking a ferry over to Orcas Island for our 3 day sea kayaking trip. 20 miles of paddling + 15-ish miles of hiking and tent camping, no problem. I went to bed earlier than I had in the past, but the sun was down and I felt great. For the most part, the first half of my first trimester was pretty active. Soon enough though, it began to involve a good amount of fatigue and mid-day crashing, but otherwise I felt like myself...though a little bloated. This trip was a great confidence boost that I’d be fine for our upcoming ladies weekend. As the backpacking trip approached, I decided to take it easy during the days leading up to our departure just to be safe. Extra rest, continued healthy eating, I was confident this would be just like the last backpacking trip in Mt. Jefferson Wilderness, but with a little bit of fall foliage. Although my body still felt like my regular body, I was extra attentive to what and how I packed. The weather was clear and sunny, which also meant colder evenings with a forecast around 30 degrees at night. My sleeping bag was rated for 15 degrees and I decided to purchase a sleeping bag liner to add an additional 15 degrees of warmth, rating me at 0 degrees; that seemed sufficient, yet packable. My sleeping pad was insulated. Down puffy coat, warm wool base layer plus an additional thermal - they were all light weight and packed well. Now the food cravings, how would I attend to those? Luckily for me, my cravings were fruit - as in give me all the fruit! I packed fresh fruit to keep in a cooler of my Jeep for before and after the adventure and packed dried fruits and kid’s squeeze pouches of fruit purees. And Electrolytes! Uncertain how to calculate how much more a pregnant body might need, I brought tablets to add to my water and electrolyte jelly beans. For dinners, I read carefully through the ingredient lists of freeze dried meals and only selected those with high amounts of protein and fiber. Then hydration - I made sure I could carry enough to super hydrate since I tend to need a ton of water in my regular body while hiking. I carried 2.5 liters in the bladder on my pack, another liter in a bottle and of course my water purifier. That was perfect! The only part of the trip itinerary that needed to be modified for me was the hot springs. Since the temperature gets up super high, it’s unsafe to go in during pregnancy. The general rule of thumb is that if the water is hot enough to raise your body temperature, it’s too hot. So while warm baths around 98 degrees are okay, long soaks in hot springs and tubs can be dangerous. Our hike into the campground was incredible, but slow. The foliage was something of dreams! My pace on the other hand, not so dreamy. With all the weight on my back plus my body in overdrive creating a tiny human, hiking was much harder here than it was a few weeks ago in the San Juans empty-handed. It felt like my legs could only propel my body at half the pace. Fortunately, my friends had my back. I didn’t want to slow them down, but we also believe in never leaving anyone hiking alone. Each friend took a turn staying behind with me at my slower pace, stopping every 10-15 minutes for a break. Halfway up, I thought to myself, “Whose body is this?! How am I moving sooo slow?! Thank goodness my friends love me. Can I really do this?” Having an amazing wolfpack who supports you means everything - for me, this fortune equaled words of encouragement and support that kept me motivated, rather than turning around when I began to question my decision and doubt myself. One good thing about a slower pace is there is more opportunity to take in the sounds, smells and scenery. My hypersensitive sense of smell was ridiculously amazing - every single scent of leaves, bark and earth was super intense and uniquely different than the last. Also, more photo opportunities! We snapped plenty of photos and had a blast doing so! However, this time around it took me an extra hour to complete. Once we got to camp, we all popped our tents, added a layer or two as the sun began to set and gathered around our jetboils to prepare dinner. It was right about then that I noticed myself taking on a chill so I grabbed my puffy coat, wool hat and added my capilene pants beneath my leggings. This is where things got rough. One of my favorite things in the world is sleeping in a tent, especially when I am bundled up and the air is cool. Tent camping is usually my best sleep ever! This time though, not so much. I made sure I was evenly snuggled into my sleeping bag liner, then my sleeping bag itself and rested flat onto my back atop an insulated sleeping pad. I’d slept outdoors in colder weather, yet this time I could feel the cold radiate upwards through my pad, sleeping bag, liner and layers and hug my entire backside. I laid for a bit hoping that I would warm up, but I couldn’t. So I turned to my side to sleep since there would be less surface area to chill me, but my hips would ache in tremendous pain - a pain I hadn’t felt before, after 15-20 minutes of resting and just before I could doze off. That pain quickly tricked down my arms and after a few tosses and turns, I noticed whatever side I rested on would go numb quickly. My body was having a difficult time maintaining it’s temperature and as a result, kept all of the blood flowing to my core, and to my growing baby. The next morning we gathered by the lake to eat breakfast and within minutes I was in tears. I was so frustrated and exhausted from tossing, turning, freezing and experiencing numbness in my limbs throughout the night. I let my friends know that I was going to head back a day early because there was no way I could do another night like that. Not wanting to interrupt the group’s plan, I let them know I would still pick them up at the trailhead the following day. They refused...because that’s what friends do. As a group, everyone agreed we’d cut our trip a day short so that. After recounting my experiences side by side- nearly identical trips, gear and weather, but one trip in my regular body and the other in my pregnant body, I’m blown away by how different they were. After writing it all down, I sat on this post for nearly a month contemplating whether or not I should share for fear that I may scare some newly pregnant women away from embarking on adventure. But that’s also the problem! It’s scary to share our true stories sometimes, but so important we do to let others know they aren’t alone. I started off my pregnancy gung ho on a mission to let the world know that nothing can keep me from being me and certainly not from adventuring...ever. I was determined to live through action and push myself as hard as I could to prove a point. And that’s a really fair reaction to media and society constantly telling us that our pregnant bodies aren’t meant to adventure or be seen; that we’re meant to sit at home and nest. Every body is different and has different needs and abilities. What’s most important is that we try! We try to be true to ourselves. We try to listen to our bodies. We try to see the lessons learned in every situation and make the modifications necessary to keep on exploring. I hydrated like crazy, acknowledged my nutritional needs and found ways to incorporate that into my packlist. I packed lots of layers, enabling me to layer up or down as needed. I communicated to my friends when I needed to slow down, when I needed support and when I needed to call it quits. Snuggled a friend for more body warmth. I was so in my head in those moments of freezing and numbness, that it didn’t even cross my mind to ask a friend to snuggle. Talked to my midwife or wellness providers while I was in the planning process of this trip, once I knew I was pregnant. Good wellness providers will support your active lifestyle and encourage you to adventure, while also educating you about your changing body and what might need to be done differently. Adventure on my preggo friends! If you have a story you’d like to share about your experiences with your bump on the trail, please reach out to me!